Le 15 Patisserie: Recipe Files: Topspinner Baqar Naseer shares his easy salad recipe! Recipe Files: Topspinner Baqar Naseer shares his easy salad recipe! I met Baqar almost 8 years ago. 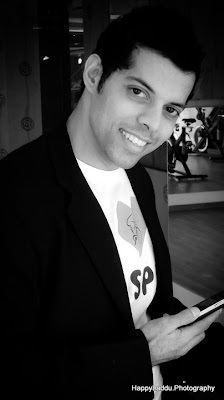 This was when the Worli Gold’s gym was called exert, I hadn’t discovered the macaron and was absolutely addicted to his spinning classes. If you haven’t tried one of his classes, you MUST do it right away. But let me warn you: it is as addictive as chocolate cake (seriously!). What is amazing about him that he hasn’t changed one single bit since the first day I met him. I recently went for a class and was delighted to meet the same funny, vibrant and encouraging guy I remembered from all those years back. I asked him to contribute to our recipe file and it is only fitting that he has given us a recipe for his favorite salad. 1. Mix and shake all the dressing ingredients in a bottle. 2. Soak the cleaned vegetables and fruits in chilled ice water for 10-15 minutes. Drain and cut into pieces of desired sizes. 3. Transfer to a big bowl. 4. Pour the dressing over the veggies and fruit and toss well. 5. Serve on a chilled plate. That note down method is without a doubt the nation's a good number of flexible type method that is definitely would once establish cutting trail it is hublot replica as being a irreplaceable method for lots of Photoshop owners. It might be would once go over for the persona, made up of Bezier shape and even switch that manufactured road to your choice. In addition it will be use that elements belonging to the trail for the persona at the start and be able to travel fake rolex and even modify that shape. GIMP: The application would mean "GNU Persona Mau Program". It will be a powerful opened form pictures manager and even runs preferably designed for Adobe Photoshop. In addition it can also be implemented to provide a quick paint spots routine, an experienced person high-quality pic retouching breitling replica sale, an overview portion developing strategy, a graphic file converter, an important majority formation persona renderer, . . .. In such a software system that ‘pen tool’ alternates that fake rolex simply because ‘path tool’ and even enjoy note down method it could actually try to make diverse choices as a result of indicating positive elements attached with an important contour. Corel Pic Paint spots: It software program is commonly employed designed for persona designing along with designed for pic using main objective. ‘Path tool’ which inturn matches note down method is commonly employed designed for cutting trail from this software system. Moreover it will require operation through Bezier shape. Cutting trail is known as a quick important fake breitling which will everybody will be able to learn about the application readily.